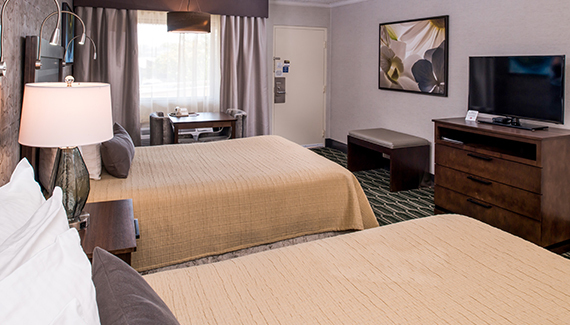 Our attractively furnished rooms and suites feature Simmons mattresses and plush premium linens, along with a variety of modern in-room amenities including 37” or larger LED Televisions, free high-speed Wi-Fi, microwaves, refrigerators, adjustable climate controls and more. 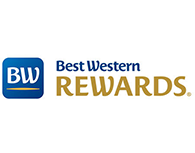 Choose the room or suite that fits your needs and budget and, when you are ready, book using our secure online booking engine for the guaranteed best rates. 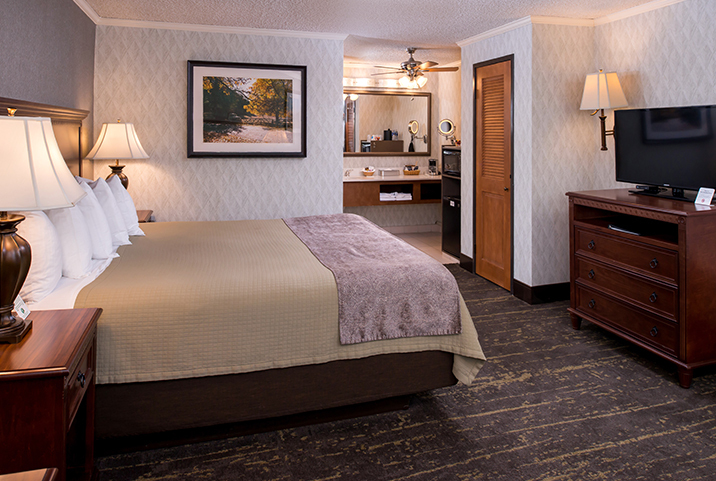 Furnished with one king-sized bed, this cozy room includes a 37” TV, desk, recliner, ceiling fan, microwave, refrigerator, coffeemaker, and all of our in-room amenities. 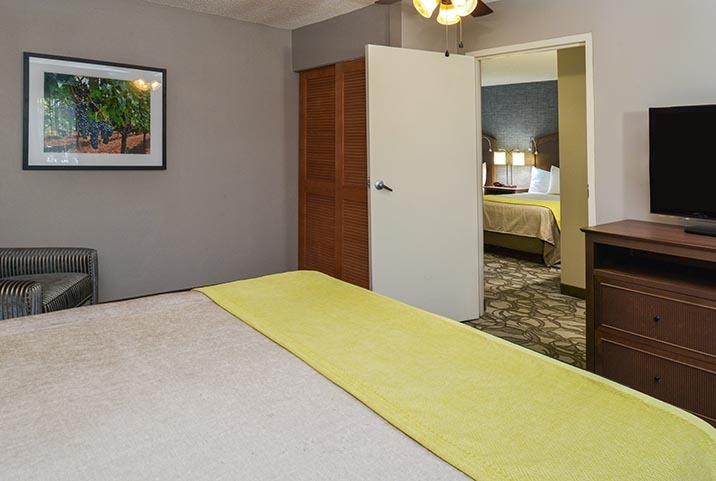 This is an ideal hotel room for a busy executive or two guests visiting Paso Robles, CA. 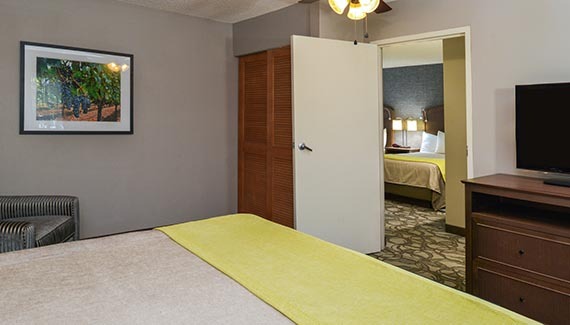 Furnished with 2 double beds, this cozy room includes a 37” TV, activity table with two chairs, ceiling fan, microwave, refrigerator, coffeemaker, and all of our in-room amenities. This room is close proximity to the pool and dining area, making it a traveler favorite. 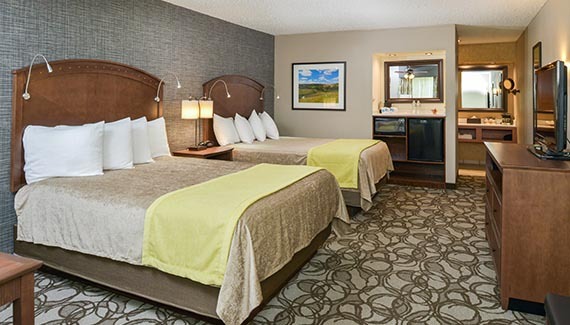 Offering added space and features, this room includes a king-sized bed, 40" LED TV, with the new 'Clean Remote', desk, recliner, ceiling fan, microwave, refrigerator, coffeemaker, and all of our in-room amenities. 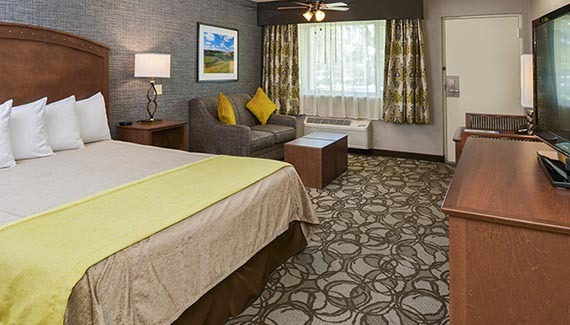 Relax in this spacious room which includes 2 queen-sized beds, 40” LED TV, with the new 'Clean Remote', activity table with two chairs, ceiling fan, microwave, refrigerator, coffeemaker, and all of our in-room amenities. This spacious, attractively decorated room features one king-sized bed and one double-sized sofa bed. 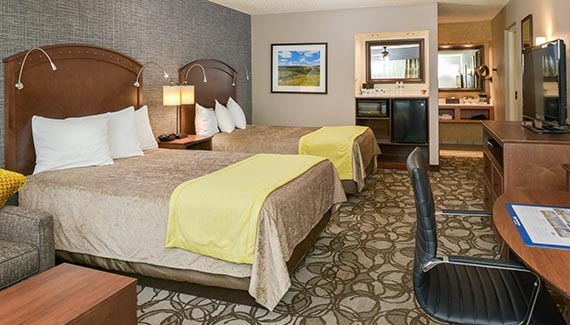 It includes a Jacuzzi bath tub, double sinks in the vanity area, office desk with ergonomic chair, 40” LCD TV, recliner, ceiling fan, microwave, refrigerator, coffeemaker, and all of our in-room amenities. 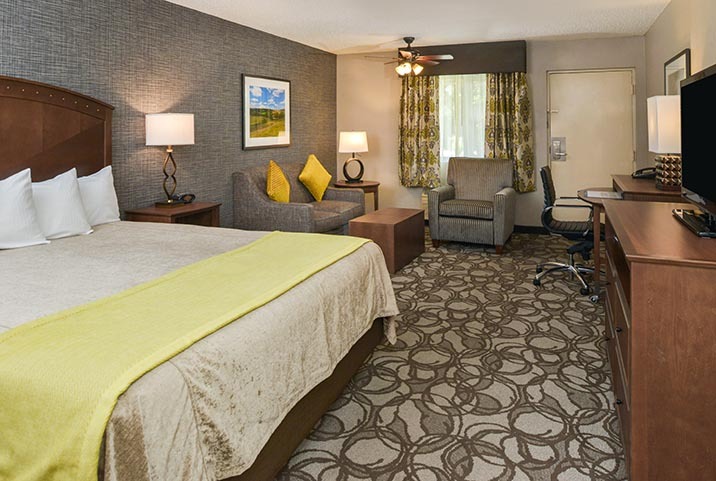 Featuring two queen-sized beds and a 40” LED television, this spacious and attractive room offers all the comforts of home. 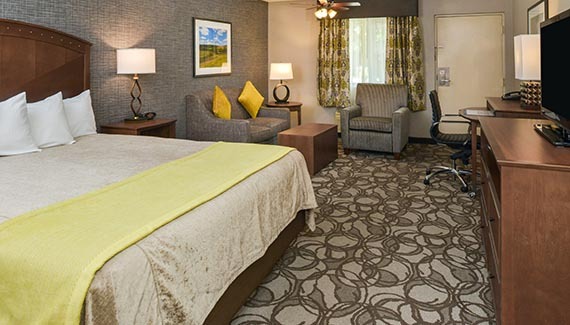 It includes double sinks in the bath area, an activity table with two chairs, ceiling fan, microwave, refrigerator, coffeemaker, and all of our in-room amenities. 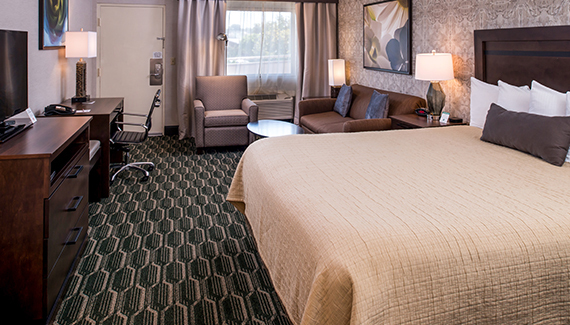 This two room suite affords all the space and comfort of our super deluxe king. 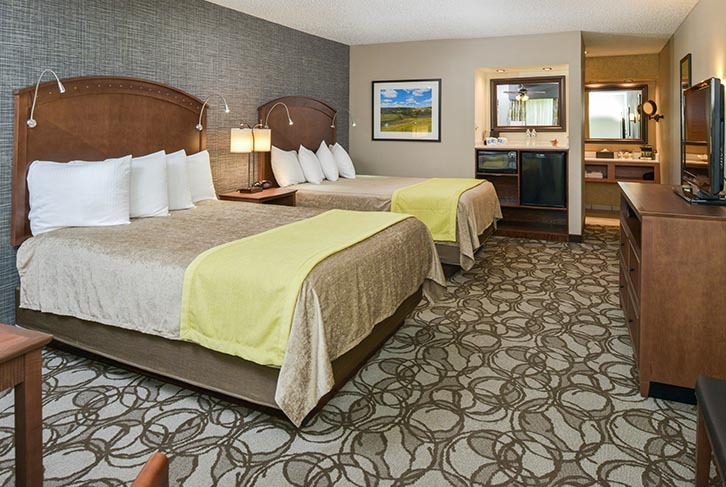 Add a second bedroom with a king sized bed and its own 40" LCD with DVD player and you've got the perfect layout for family, friends or even corporate travel. 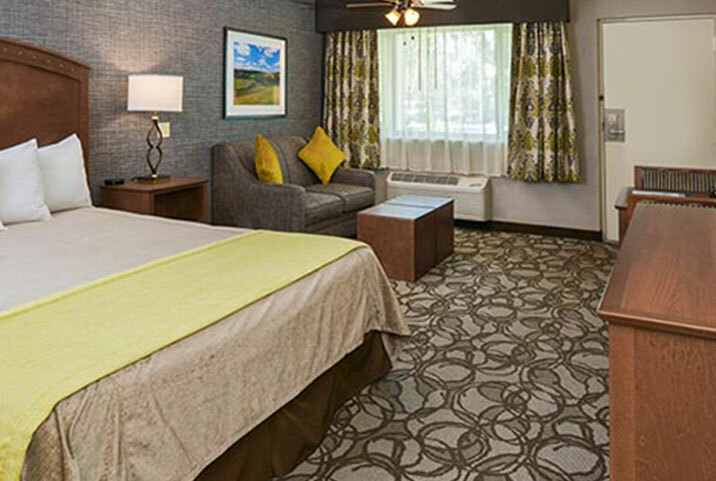 Each room has individually controlled heating and cooling to make everyone happy. While this room offers one bath area, you'll find plenty of space for everyone to prepare for the day with the double vanity sinks. This suite can accommodate up to 6 persons, with two persons per bed and two on the double sized pullout sofa. This suite is available on the upper level only. 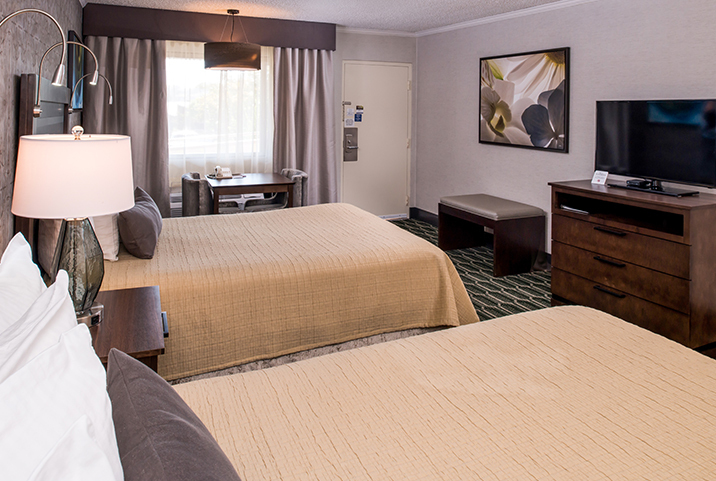 Our two room suite is designated as non-smoking. 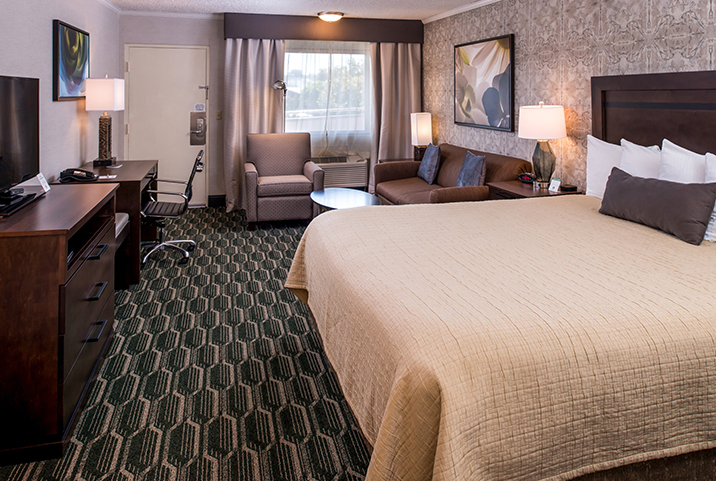 This two room suite affords all the space and comfort of our super deluxe king. Add a second bedroom with two double sized beds and its own 40” LED with DVD player and you’ve got the perfect layout for family, friends or even corporate travel. A double-sized pullout sofa allows for additional guests to stay in comfort. 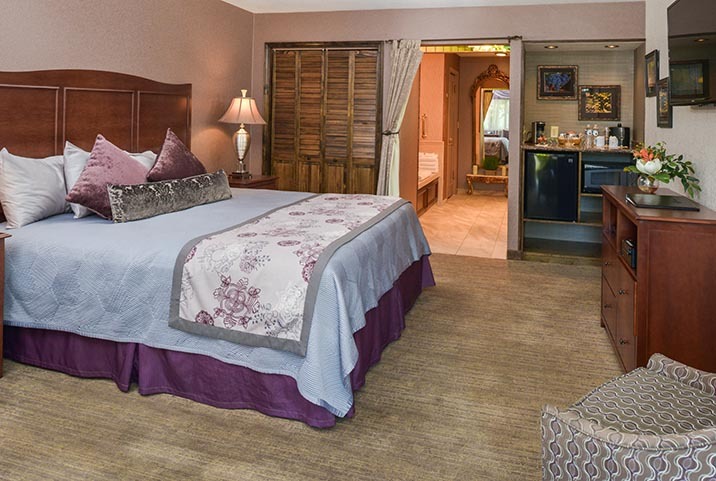 Each suite has individually controlled heating and cooling to make everyone happy. 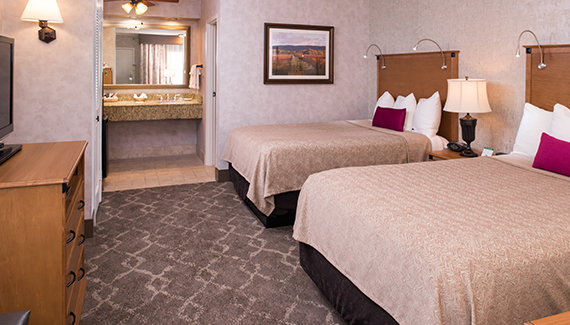 While this Black Oak Paso Robles Hotel room offers one bath area, you’ll find plenty of space for everyone to prepare for the day with the double vanity sinks. The suite can accommodate up to 8 persons, with two persons per bed and is available on the ground level only. Another specialty room for up to five persons, it features two queen sized beds and a twin-sized pullout sofabed. A large work desk and comfortable work chair make it easy to conduct work or check e-mails. This room is located upstairs only and is designated non-smoking. 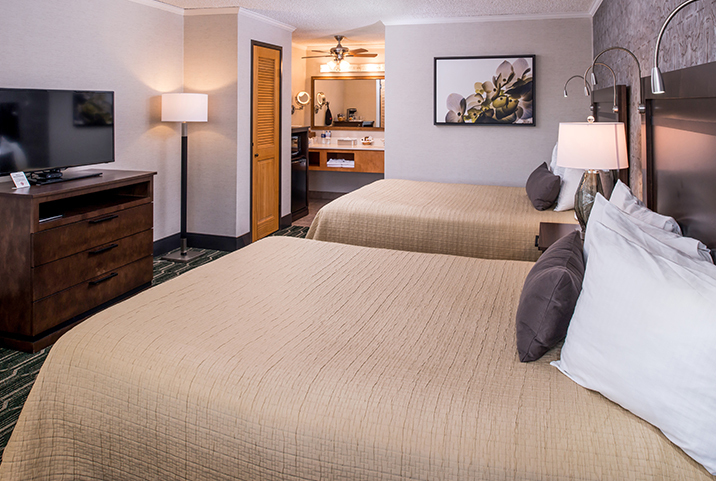 The King Mini Suite is great for a small family, couple or business executive. 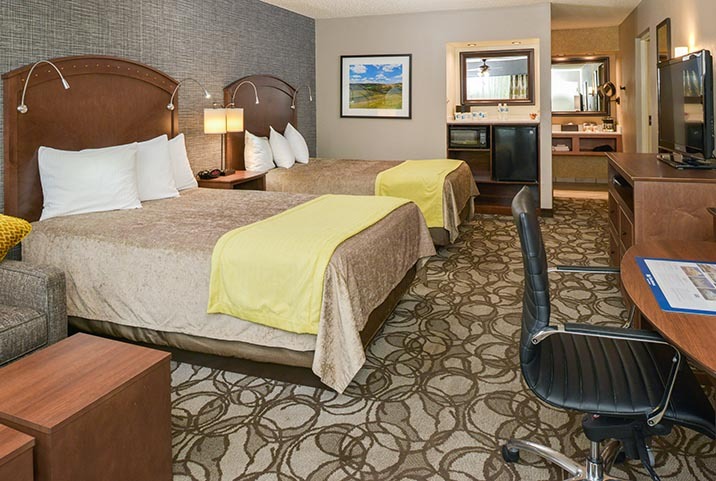 This oversized room features a king bed, Jacuzzi bathtub, desk with chair, double sized sofa-bed, recliner, and 40" LED television with DVD player. While sitting at the desk or relaxing in bed, you will enjoy your own private garden area outside your window. This room is located downstairs only and is designated as non-smoking. 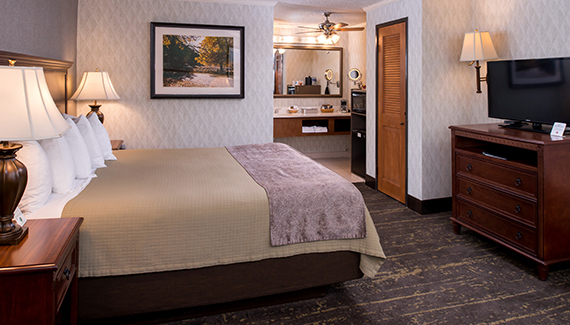 Decorated with local artwork and furnished with our finest amenities, this recently remodeled suite is perfect for a romantic getaway. It includes one king-sized bed, a full-size Jacuzzi tub, 40” TV with Blu-Ray player and also a stereo system with additional speakers in the tub area. 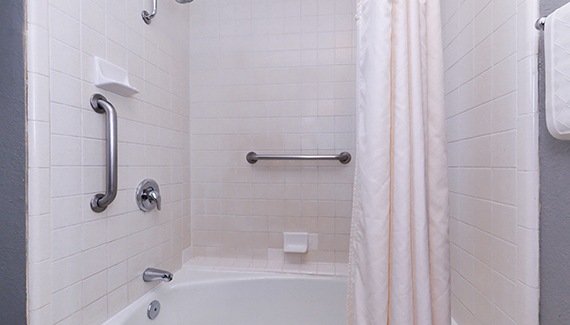 The bath area features a separate free standing shower, double vanity sinks, commode and bidet. The suite also includes an activity table with two chairs, microwave, refrigerator, coffeemaker, and all of our in-room amenities. This well-appointed room cannot accommodate a rollaway and is not intended for families. This non-smoking room is located on the ground floor. 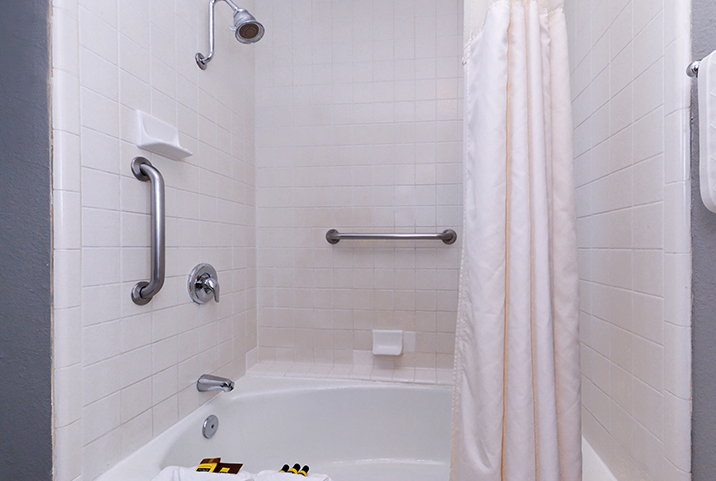 For the comfort and safety of our disabled guests, this room features a lift-accessible bed frame and roll-in shower. 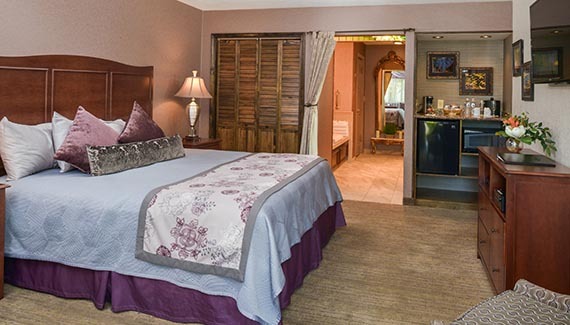 It includes one king-sized bed and one double-sized pullout sofa, along with a 40” TV, activity table with two chairs, double sinks in the bath area, microwave, refrigerator, coffeemaker, and all of our in-room amenities. 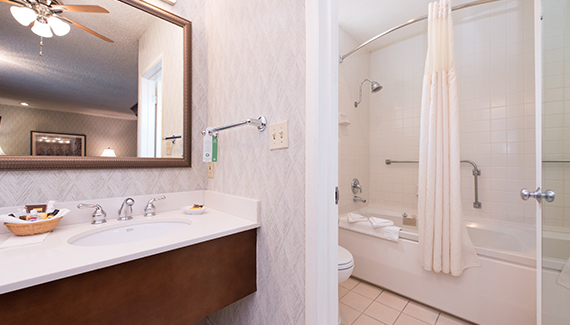 For the comfort and safety of our disabled guests, this room features a lift-accessible bed frame and shower-tub combo with additional grab bars. 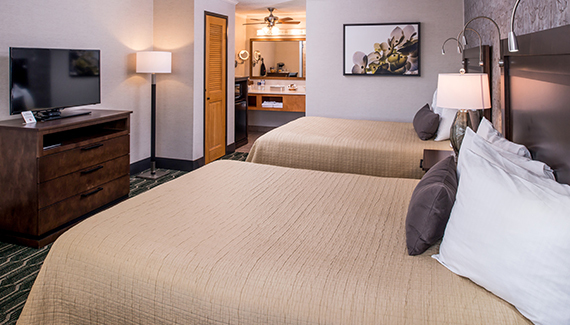 It includes two queen-sized beds, a 40” TV, activity table with two chairs, ceiling fan, microwave, refrigerator, coffeemaker, and all of our in-room amenities.